BOZEMAN, Montana, August 29, 2016 (ENS) – A fish kill caused by a microscopic parasite prompted Montana wildlife officials to shut down 175 miles of the Yellowstone River and its tributaries to recreation last week. The unprecedented move was taken to prevent a parasite that causes kidney disease in fish from spreading to other rivers, or south into Yellowstone National Park. Tetracapsuloides bryosalmonae is a myxozoan parasite of salmonid fishes. It causes proliferative kidney disease, one of the most serious parasitic diseases of salmon populations in Europe and North America. The disease has been documented previously in two isolated locations in central Montana over the past 20 years. Recent outbreaks have occurred in Washington, Oregon and Idaho, and it is known to occur in Canada and Europe as well. Other factors – high water temperatures, low stream flows and recreational stressors – in concert with this infection increase fish mortality. Environmental conditions overall on the Yellowstone River have been poor in terms of both flows and temperature, state officials say. On August 19, FWP implemented a complete closure to all water-based recreation on the Yellowstone River and its tributaries from Yellowstone National Park’s northern boundary in Gardiner to the Highway 212 bridge in Laurel. “The decision to close the river was not taken lightly,” said FWP in a statement. “We recognize that this decision will have a significant impact on many people. However, we must act to protect this public resource for present and future generations,” Hagener said in a statement. “A threat to the health of Montana’s fish populations is a threat to Montana’s entire outdoor economy and the tens of thousands of jobs it sustains,” said Governor Steve Bullock. Montana’s outdoor recreation economy is responsible for more than 64,000 Montana jobs and nearly $6 billion in yearly economic activity. The closure is intended to limit the chance the parasite will spread to adjacent rivers through boats, tubes, waders and other human contact and minimize further mortality in all fish species. FWP understands this decision has and will have a tremendous impact on local communities, businesses and visitors. The final decision came from Montana’s Fish and Wildlife Commission, with support from Governor Steve Bullock. Governor Bullock Friday activated the Department of Labor and Industry’s Rapid Response Unit to provide resources, training and information to Montanans impacted by the recent closure of the Yellowstone River. The Rapid Response Unit, created through the Dislocated Worker Program, will hold a public information meeting Monday, August 29 at the Yellowstone Pioneer Lodge in Livingston. The meeting is free and open to the public. Montana Fish, Wildlife and Parks began surveying the Yellowstone River on August 12 after receiving reports of numerous dead mountain whitefish. Crews paid close attention to the hardest hit area – the stretch of the Yellowstone from Emigrant to Springdale. To date, officials have counted more than 4,000 dead whitefish and a small numbers of other species including rainbow trout, Yellowstone cutthroat, longnose suckers, sculpin, and longnose dace. Montana Fish, Wildlife and Parks has confirmed the fish kill as far upstream as near the border of Yellowstone National Park to Grey Bear Fishing Access Site – nearly 100 river miles. Samples collected of live, dying and dead fish on numerous main stem floats since August 13 were sent to, and have been processed by the U.S. Fish and Wildlife Service Bozeman Fish Health Center. Initial tests results on whitefish which came back late last week indicate the catalyst for the fish kill is Proliferative Kidney Disease. In recent results, the one Yellowstone cutthroat found dead also tested positive. Other testing continues; results will be posted as they become available. As an agency, FWP has no intent to keep the river closed any longer than necessary. FWP is doing everything it can to get the information needed to make the right decisions considering the health of the river while making sure all those affected by this closure are kept in mind and informed. At the same time, there are no set criteria for reopening the river as this is an unprecedented event. “This is a fluid situation and there is the possibility to evaluate the reopening of different segments and to some recreational uses as we gather more information,” FWP said. Formal evaluation of the closure will take place at least every three days using the latest data and testing results. The parasite associated with this fish kill has not been shown to cause health problems in humans, birds, dogs and other mammals. 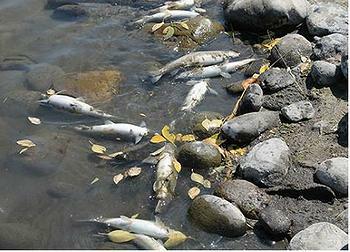 But, bacteria and other harmful materials associated with decomposing fish could sicken pets. FWP is urging the public to keep pets out of contact with fish carcasses along the banks of the Yellowstone River.